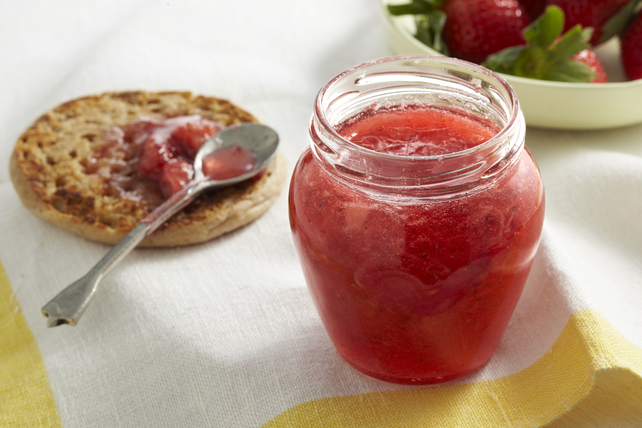 Head to the berry patch and pick some strawberries for our Easy No-Cook Strawberry Jam. Turn them into homemade jam using our 3 simple steps - you'll never buy store-bought jam again! Mix berries and sugar until blended. Let stand 10 min., stirring occasionally. Add pectin and juice; stir 3 min. or until most the sugar is dissolved. Pour into clean jars or plastic containers; cover with tight-fitting lids. Let stand at room temperature 24 hours or until set. Freeze up to 1 year or refrigerate up to 3 weeks. Add 1 Tbsp. orange or lemon zest to crushed strawberries before mixing with remaining ingredients as directed. You will need to start with about 4 cups fresh whole strawberries to get 1-3/4 cups crushed berries. Use a potato masher to crush the strawberries, crushing them one layer at a time. For best results, do not crush the berries in a food processor.